For colored gemstones, cutters are paid based on weight, so they usually add a little weight to the pavilion (above right). Synthetic gems and colored glass are cut for speed; the pavilion will generally not contain any bulge (above left). The shape will be similar to the cut of a round brilliant diamond. You should be able to see pavilion bulge without magnification. Glass was often used to imitate gemstones in antique jewelry. Below is a simple test you can perform with a penlight. Glass is a often used to imitate onyx, too. You will be able to see light through the glass, but not the onyx. 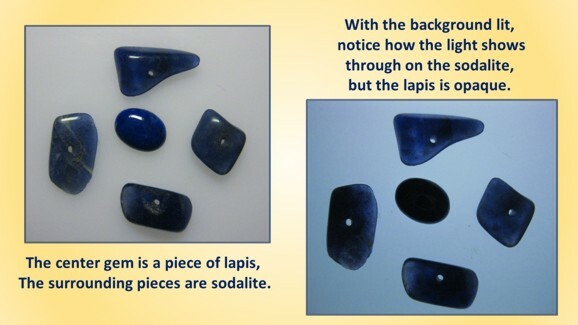 Sodalite is often used as an inexpensive substitute for lapis lazuli. 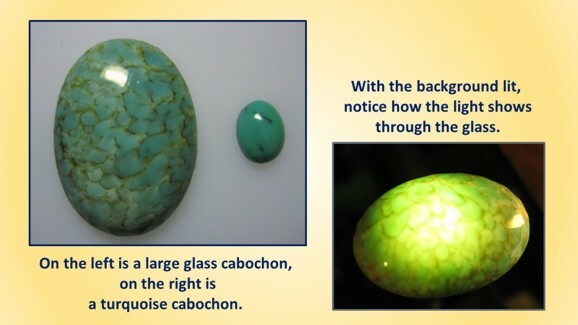 You can use penlight to tell the difference between these gemstones, too. Someone from Specialty Appraisals will be happy to talk with you about our antique jewelry appraisal services. As a certified gemologist, Ms. Cinamon also offers fine jewelry appraisal services. Call us toll free at: (877) 255-5445. We are located in Southern California.